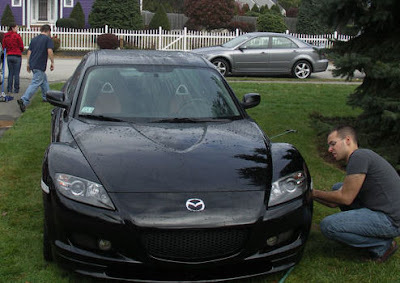 The annual NEPOC "Fall Clean Meet" was held today over at Mark's house in West Bridgewater! Not only do These meets seem to get bigger and bigger, but the fun just never ends. Mark (as usual) was working on his car instead of cleaning it, installing a transmission cooler that he has had lying around for awhile now. James was trying to install his new REALLY stiff Progress Tech sway bars (same sway bars used by the SpeedSource RX-8 in the Rolex GT series) but had no luck as he unfortunately snapped the bolt off in his rear somewhere. Poor guy had to drive home with a sway bar half on at the end of the meet! Josh did some talking with Poorboy's World and they sent us a ton of great detailing supplies for the meet! Things ranging from wax, to detail and polish. Unfortunately I did not get to use the "Black Hole" product but from what I saw, it was an impressive product. With the good times, seeing new faces and hanging out with the usual buddies, it was a hell of a meet. Pictures taken by Josh can be viewed here few while pictures from Chris can be viewed here! Thanks a ton guys! Most welcome. She's looking much better.